The impact of the Convention on those states which can claim status as archipelagic states due to the fact that they consist of a group of islands forming an intrinsic geographical, economic, and political entity is considerable, as all of the water area between the islands (the archipelagic waters) is under the sovereignty of the state, regardless of the depth of the water or the distance from the coast One of the consequences of this assignment of sovereignty is that passage of vessels through these areas is basically innocent passage. 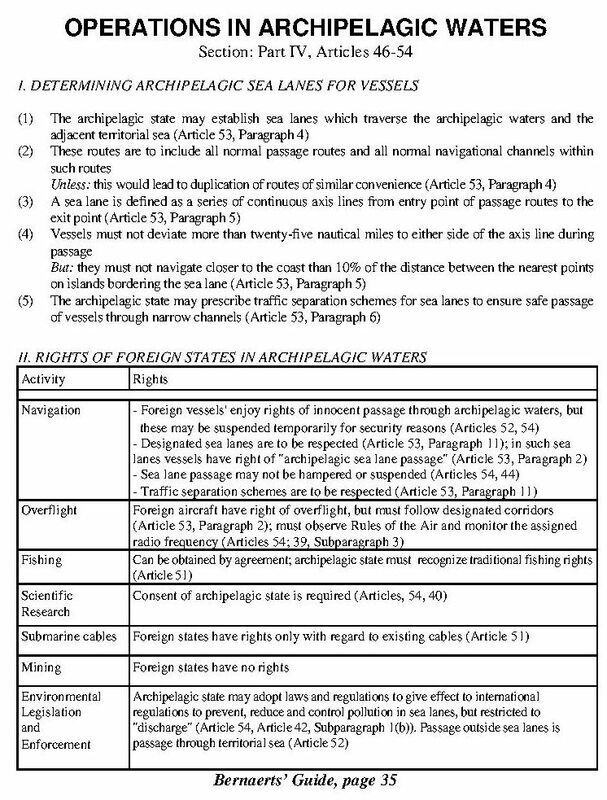 Sea lanes and air routes through archipelagic waters are governed by specific regulations, including certain provisions of the regime of passage through straits. Vessels are to respect sea lanes and traffic separation schemes. 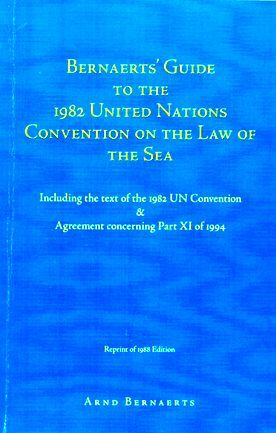 As long as the archipelagic state has not designated sea lanes as provided by the Convention, the routes normally used for international navigation may be used as "sea lanes," with the status of "archipelagic sea lane passage". If necessary for the security of the state, navigation may be suspended temporarily in specified areas of the archipelagic waters, but this may not result in a suspension of sea lane passage. An archipelagic state may draw straight archipelagic baselines of a maximum of 125 nautical miles in length to join the outermost points of the outermost islands and drying reefs, provided that the ratio of land to water is not more than 1:1 and not less than 1:9. These baselines are to be shown on charts and given due publicity. The waters enclosed by the archipelagic baselines are the archipelagic waters and are under the sovereignty of the state. 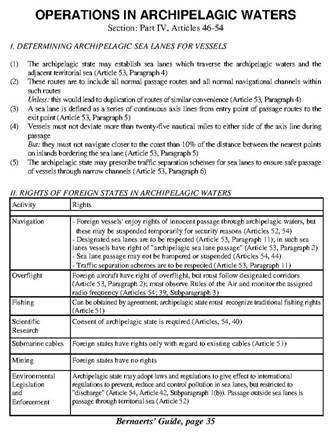 The legal concept of archipelagic waters is without prejudice for the right of the state to draw lines for the delimitation of internal waters in accordance with Articles 9, 10, and 11 for the mouths of rivers, bays, and ports. Such lines of delimitation are known as closing lines rather than baselines as in the territorial sea concept, as they serve only as the boundary for waters completely outside the jurisdiction of the Convention (internal waters) and do not act as the starting point for establishing zones. There is no right of innocent passage in internal waters enclosed by closing lines, even if they were not considered internal waters previously, a further contrast to the territorial sea concept. The territorial sea, contiguous zone, exclusive economic zone, and continental shelf are measured from the archipelagic baselines, not from the closing lines drawn to delimit internal waters. An archipelagic state may designate sea lanes through its archipelagic waters and through the adjacent territorial sea as well, and establish air routes there above. An archipelagic state is to respect existing agreements and to recognize legitimate activities by neighbouring states in its archipelagic waters; this includes existing submarine cables passing through the archipelagic waters. An archipelagic state is to permit the maintenance and replace�ment of such cables. In respect to pollution matters, there is a curious situation which might raise some concern in practice. Archipelagic sea lane passage is obviously intended to have a status similar to that of transit passage through straits." But whereas the general enforcement regulations for pollution from vessels referred to in Part XII (Pollution) are not applicable in straits, a corresponding exclusion for archipelagic sea lane passage, either expressis verbis or by reference, does not exist. Archipelagic states may therefore apply Part XII to the full extent if not contrary to specific provisions of Part IV.